The southern Cape is remarkable for the number of rare and endemic frogs. Many of these frogs occur in the mountains and are poorly known. 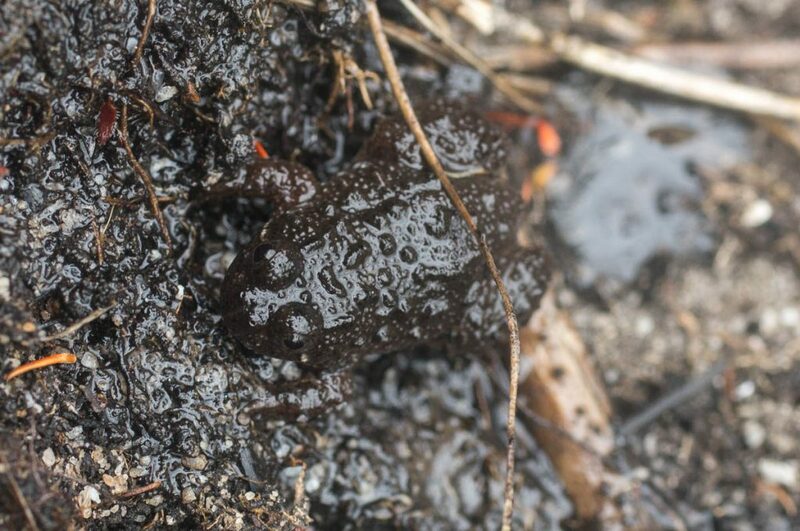 We recently discovered a small frog in a damp marshy area on the upper slopes of Phillipskop. It has been identified as the Montane Marsh Frog (Poyntonia paludicola), a narrow endemic, restricted to the mountains of the Hottentots Holland, Kogelberg and Klein River Mountains. 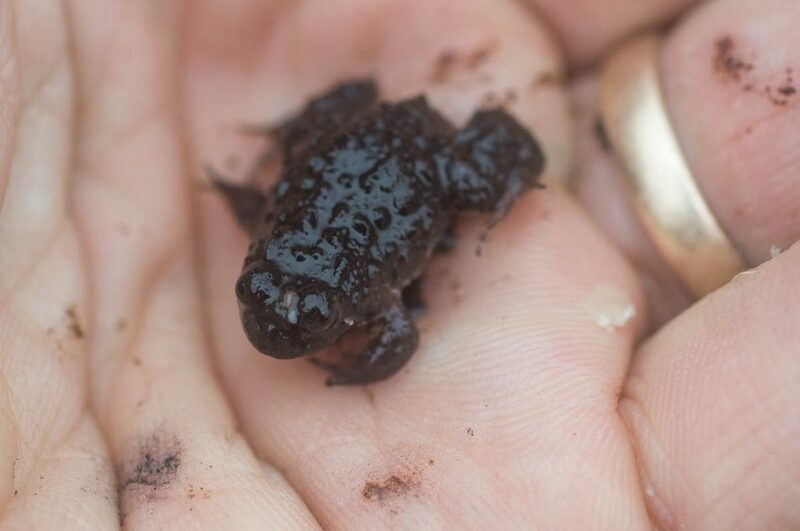 The Montane Marsh Frog is only about 3cm long. 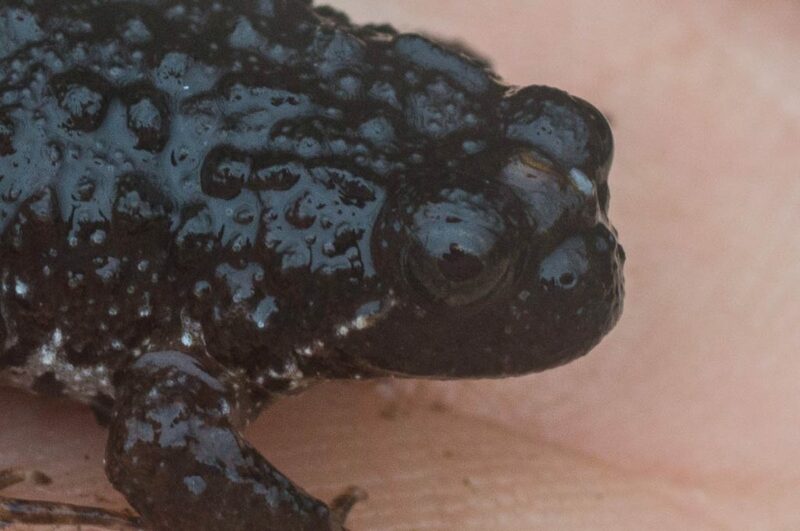 It is covered with many small warts, which make it look more like a toad than a frog. Several technical characters are used to identify it but to the layman there is a line of warts running diagonally from behind the bulbous eyes to the meeting of the jaw. Our specimen was a dark blackish brown but colour is very variable in frogs and there is often a thin reddish stripe that runs along the back. As its common name suggests, its habitat is in marshy areas and seepage zones rather than streams. The scientific name also reflects its habitat, “paludicola” means “marsh-dwelling”. It is found in mountainous areas above 200m altitude (recorded at 280m at Phillipskop). The Montane Marsh Frog was only recognised as a species in 1989. A few specimens had been brought to the attention of the experts by hikers in the mountains. The experts had been unable to place the specimens with confidence to any known frog. In fact, the frog was considered so distinct that when they did name it, they placed it in a genus of its own, Poyntonia, and it is still the only species in that genus. The frog was originally known from about 5 localities. More have been discovered since, including at Fernkloof, Vogelgat and Maanschynkop in the Klein River Mountains. However, this is the furthest east that the species has been recorded, thus expanding its known range. It is classified as Near Threatened by the IUCN due to its limited range and threat by alien plants. Knowing that it is protected at Phillipskop will help to ensure its ongoing survival. frog, Klein River Mountains, marsh, Poyntonia, redlist. Bookmark.